This culinary adventure takes place in Amalfi’s enchanting coastal village of Sant’Agata sui due Golfi, only a short drive from Sorrento. Hugged by miles of rolling, lush green hills and glisteningly azure Tyrrhenian Sea, the Amalfi region and its myriad traditional fishing villages and charming towns form one of Southern Italy’s most dreamily beautiful spots. 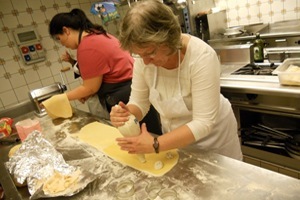 On this cooking course on the Amalfi Coast you will tour the region and you will be able to experience the idyllic surroundings and charmingly rustic towns and villages, taking in all the sights and sounds of its culture, and getting to grips with the unique flavour combinations that really define this area of Southern Italy. From the luxurious island retreat of Capri to the haunting historical ruins of Pompeii, through the tangles of cobbled streets that run throughout the region’s multitude of littoral towns, you will explore the culture, stunning natural landscapes and undulating vineyards that have enchanted and seduced travellers for generations. Situated atop Sant’Agata sui due Golfi’s verdant hill-scape, The Amalfi Coast Culinary Experience will take place in the spacious and modern kitchen of the four-star hotel you will also be staying in. Built specifically for culinary tours and classes, the kitchen is fully-equipped with everything you could possibly need, with sleek granite counters and an outdoor veranda with breathtaking views. You will be led by Chef Carmen, a well-respected expert on Mediterranean cuisine, who will take you through every step of the process to produce dishes including Sorrento-style gnocchi, stuffed calamari, Neopolitan artichokes and of course, the traditional pizza. All recipes you will use call for fresh, locally-sourced ingredients and have been passed down through generations of cooks and families. After you have worked hard preparing and cooking your dishes, it’s out to the veranda to reap the delicious benefits of your efforts, enjoy a drink and a laugh with other pupils, and take in the beautiful splendor of your surroundings. On The Amalfi Coast Culinary Experience you will stay at the beautiful 4-star Oasi Olimpia Relais Hotel, nestled in amongst the sun-kissed hills of Sant’Agata sui due Golfi. The hotel is chic, classic and beautifully furnished, boasting a 15m swimming pool, Jacuzzi, tennis court, wine bar, exercise room and stunning private beach. Love the Amalfi Coast & are looking for a step-up in the cooking? Read more about our Michelin Star Cooking Experience on the Amalfi Coast!